Need a Cure for Procrastination? Try the Finite Increment! Need a Cure for Procrastination? Can't get started on that project? Well, maybe you need a cure for procrastination. And as it happens, you probably have one in your possession right now: a portable timer. Which, in the right hands, can be as good as a magic wand. Plus, it also works when you're simply trying to change a habit. Why? Because this modest tool helps you “sneak up” on your target, as opposed to making a frontal attack. In that way, you often forestall resistance and the failure that sometimes ensues. 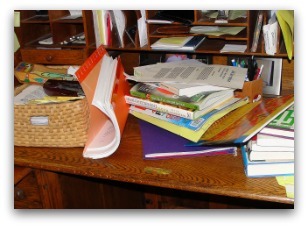 Let’s look first at something relatively simple—gaining control of some clutter. Here, we'll use "your" messy desk as an example. But this method works equally well with other forms of clutter. And for this, as for those other clutter sites, you may need your "cure for procrastination." These piles and mounds can create a huge distraction for you. Yet the idea of tackling them often lacks appeal, particularly if you’re involved in other projects and/or tasks. So there they often sit, smoking away in the background. You'd sure like to zap those suckers, but you just can't seem to get it done. Enter to great applause the Finite Increment, a short block of time you devote to that devil-desk and then walk away. Maybe it’s only five minutes; maybe it’s ten or fifteen—even twenty. You get to decide: it's your timer, after all. But if you devote one or more short blocks of time daily, before too long you will get it done. You'll have that desk in shape. After that, you may need just the occasional maintenance block to keep it that way. An appealing aspect of this approach is that it lends itself equally to the initial endeavor and also to the maintenance. Win-win all around, plus it works on other kinds of clutter, too. So, you've seen a tedious task yield to the finite increment (consistently applied). But suppose you wanted to change a habit. In fact, let’s imagine you’re a relatively late sleeper, who also realizes this extra sack time is costing you. Instead of sleeping it away, you could be using that hour or two for a hobby, or perhaps to learn a new skill or do some working out. To name but a few. Getting up early is awfully hard for you, though. In fact, you're not sure you can pull it off. But you really, really want that extra couple of hours... So you decide to apply your cure for procrastination to your sleeping habits. You probably don't call it that, or even simply the finite increment, because you'd feel like a dork. And it doesn't matter what you call it, anyway. What matters is that you apply it—that you get on with it, whatever "it" is. In this case, your strategy begins not with a timer but with a digital alarm clock. For the sake of your nerves, you choose a model with a gentle tone as opposed to the traditional BRRRRRR. And now the campaign begins. On the first night, you set your alarm a minute earlier than the usual time: just a single minute, but you do it. That minute is your finite increment. Each night thereafter, you set your alarm another minute earlier. Or, if you’re a particularly hard case, perhaps it's one minute every other night. Whatever you can live with is how you do it. Again, you just make sure that you Do do it. Maybe after a week or two, if the process seems fairly painless, you start alternating: one minute earlier one night; two minutes earlier the next. In this gentle way, you gradually ease your body into a new pattern.